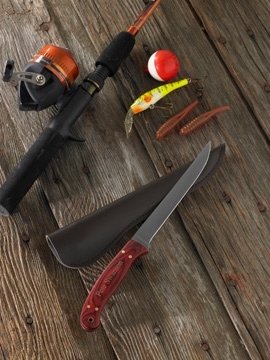 * Every angler needs a sturdy and reliable filet knife, and this personalized one is a real beauty as well! * The razor sharp, stainless steel blade is attached to an attractive solid wood handle for a professional grade knife. * Comes in a sturdy black faux leather sheath for safe-keeping. * Measures 10 1/2" with a 6" blade.